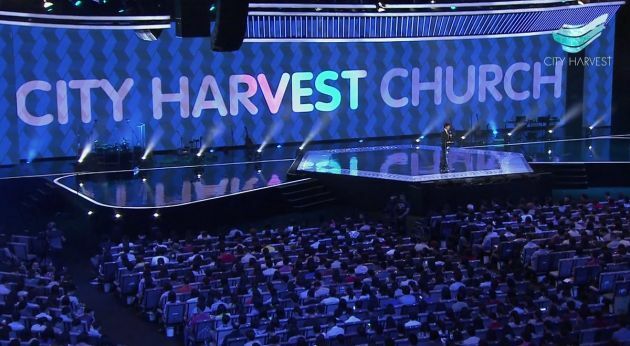 (Photo: City Harvest Church / Youtube)Pastor Kong Hee preaches a sermon at City Harvest Church in Singapore on November 17, 2013 in a video still available on the site's YouTube channel. The imam who was the chief cleric at a mosque in Singapore has been fined and will be repatriated to India for making offensive remarks targeting Christians and Jews that authorities said aimed to "repudiate divisive speech." During Friday prayers on Jan. 6, the cleric, Nalla Mohamed Abdul Jameel Abdul Malik, sued the phrase, "Grant us help against the Jews and the Christians," the Singapore Ministry of Home Affairs said on its website. The 46-year-old cleric pleaded guilty to one count of committing an act which he knew was prejudicial to the maintenance of harmony between different religious groups and was likely to disturb the public tranquillity, the todayonline newspaper reported. It was believed to be the first case in multi-ethnic Singapore of a religious leader being prosecuted for delivering an inappropriate sermon. The cleric known locally as "Nalla," apologized and "recognised that it was unacceptable in Singapore's multi-racial and multi-religious context," the ministry said in a statement, Reuters news agency reported. After pleading guilty before a Singapore court, the cleric was fined 4,000 Singapore dollars (US$2,862). The home affairs ministry said, "He will be repatriated...Any religious leader from any religion who makes such statements will be held accountable for their actions." It said the government has "the responsibility to act quickly and firmly to repudiate divisive speech, even if the course of action is sometimes difficult." The ministry noted, "Nalla has worked diligently as Chief Imam at the Jamae Chulia Mosque over the past seven years, attending to the needs of his congregation, and reaching out to other faiths. He has not been deliberately malicious." "Nevertheless, what he did was wrong. And he has admitted it," a ministry spokesperson told Today. "Given the nature of the breach, action had to be taken. The fair and impartial application of the law protects all communities, including Muslims and other minority religious communities. The Government has taken firm action against persons from other religions as well." While the imam had since made a public apology and met interfaith leaders to express regret, District Judge Jasbendar Kaur said a deterrent sentence was warranted given strong concerns from the public. The judge said Singapore cannot allow any person or group to sow discord or promote enmity among different religious or racial groups, the judge said. Muslims are thought to make up nearly 15 percent of Singapore's nearly six million people while Christians account for 22 percent and Hindus just over 5 percent. Buddhists make up for 34 percent of the population and Taoists 11 percent.